If we ever go out to eat at a chain restaurant like Buffalo Wild Wings, Red Robin or some place like that, I always go straight for the “wrap” options on the menu. Wraps always sound good to me, and I also love to get ideas from the menu of ways I can make them from home. They make great, EASY dinners, and I can always count on my family to eat them happily. Check out some of our favorite other wraps. 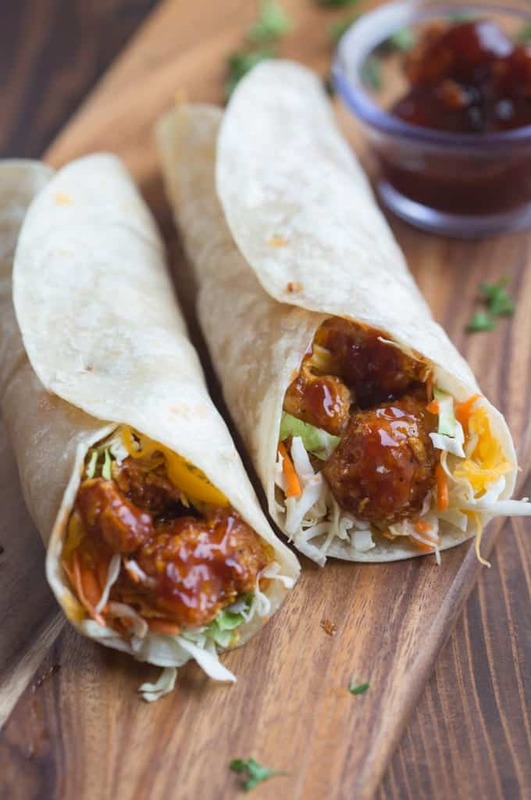 These Honey BBQ Chicken Wraps were developed in the aftermath of making this yummy baked popcorn chicken. We loved this crispy, juicy popcorn chicken so much (especially dipping it in BBQ sauce!) that I knew immediately that I wanted to transform it into a wrap. 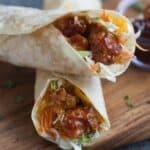 I kept this recipe pretty simple because they crispy baked chicken smothered in BBQ sauce is the real star of the wrap. I added some coleslaw for crunch and flavor and the end result was completely DELICIOUS! Place the baked popcorn chicken bites into a large bowl. 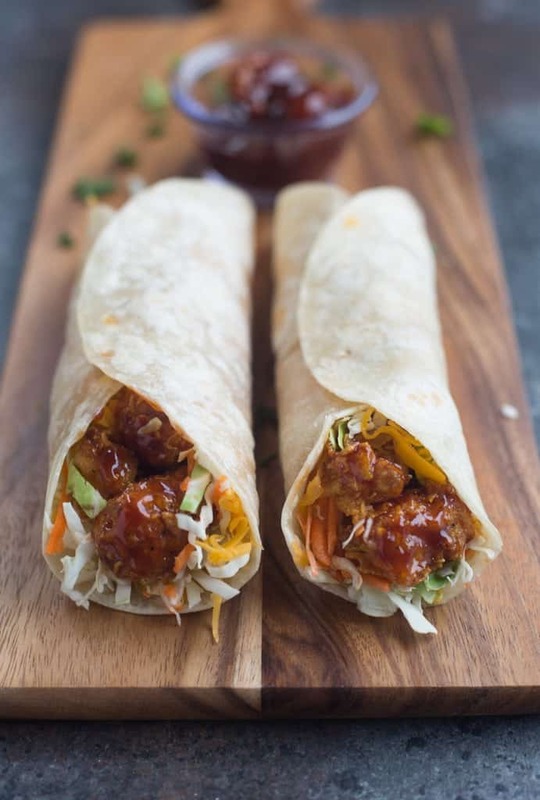 Pour most of the warm honey BBQ sauce on top (reserve a little extra for dipping or adding to the wraps) and gently toss to coat. Sprinkle a handful of shredded cheese on the base of the tortilla. I like to place them on a hot skillet for a minute or two for the cheese to begin to melt. Top with 5-6 pieces of bbq popcorn chicken. Drizzle with a little more BBQ sauce if you like a lot of sauce. Top with a handful of coleslaw mix. Roll and secure with a toothpick, if needed. Serve immediately. Try these crispy southwest wraps, chicken bacon avocado wraps, or these BBQ side dishes. 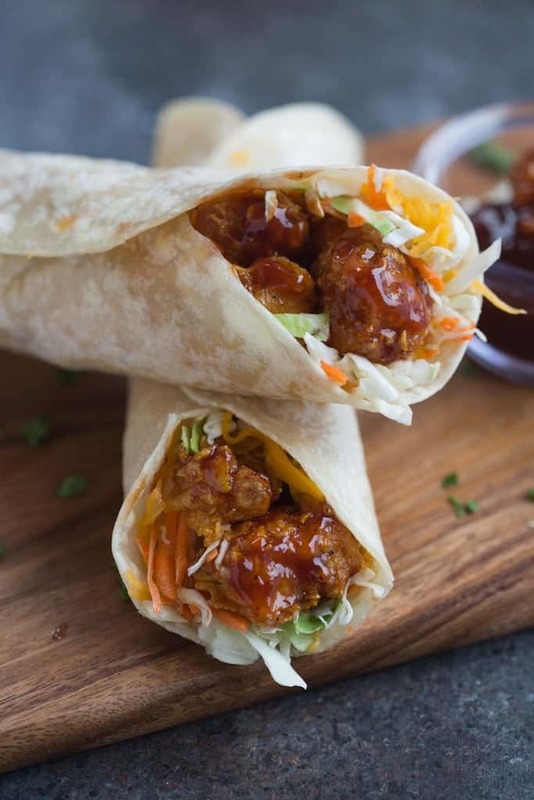 Absolutely love your creative idea with honey bbq chicken wraps! Can I post it on my blog? Thanks, Lauren for sharing!